At the Institute of NanoSciences of Paris, we study the structure and growth mechanisms of silicene and germanene obtained by material evaporation under UHV on various substrates (Ag, Al, layered materials). We use in-situ scanning tunneling microscopy (STM) and grazing incidence X-ray diffraction (GIXD) together with density functional theory (DFT) calculations (coll. M. Lazzeri, Sorbonne Université, Paris, France and C. Hogan, CNR Roma, Italy). We collaborate also with other research groups in France (CINaM, Marseille, IS2M, Mulhouse, IEMN, Lille, SOLEIL Synchrotron, Saclay) and Europe (Uppsala University, Sweden, Helmholtz-Zentrum Berlin, Germany). Because of its immiscibility with Si , Ag appears as a good candidate for the growth of a silicene layer. The first hypothesis that silicene may exist was given for silicon nanoribbons that form on a Ag(110) surface. However, the assumption that the observed structures (see Fig. 1) were actually silicon hexagons was highly controversial. For the first time, we have followed, by STM imaging, the evolution of a well defined region of the sample during the growth process. Our results clearly show an important modification of the substrate during the growth. Indeed, STM images recorded during the deposition of Si show the growth of new Ag islands, either on the step edges or on the terraces (see figure 2). This implies that the adsorption of Si atoms induces the release of Ag atoms from the substrate. 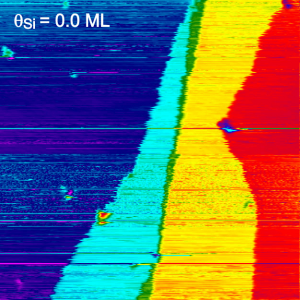 Fig 2 : sequence of STM images (330 × 310 nm2) of the same area showing the evolution of the silver surface, at room temperature, upon increasing Si coverage. This result was confirmed by the evolution of the GIXD pattern during the growth, showing the formation of a missing-row reconstruction. From a direct comparison between X-ray measurements and DFT calculation, we have concluded that the Si atoms in the ribbons were arranged in rows of alternate pentamers (see figure 3). This model also agrees with STM images. Figure 3 : a) detailed STM view of a Si nanoribbon. (b) simulated STM image from DFT computation. c) model of Si pentamers (green). The red rectangle corresponds to the surface unit cell. d) comparison between experimental (blue) and simulated (black) structure factors obtained from X-ray intensities. Evaporation of one monolayer (1 ML) of silicon on Ag(111) leads to the formation of various superstructures on the substrate. The most studied one corresponds to a (4x4) reconstruction with respect to Ag(111). On the basis of angle resolved photoemission spectroscopy (ARPES), STM and DFT calculations, it has been described as a (3x3) silicene reconstruction, giving rise to Dirac cones in the electronic structure near the Fermi level. We have precisely measured the diffracted intensities for this structure and we have compared the results to simulated intensities from DFT computations. A perfect agreement is found with a model of a buckled silicene layer (see figure 4). 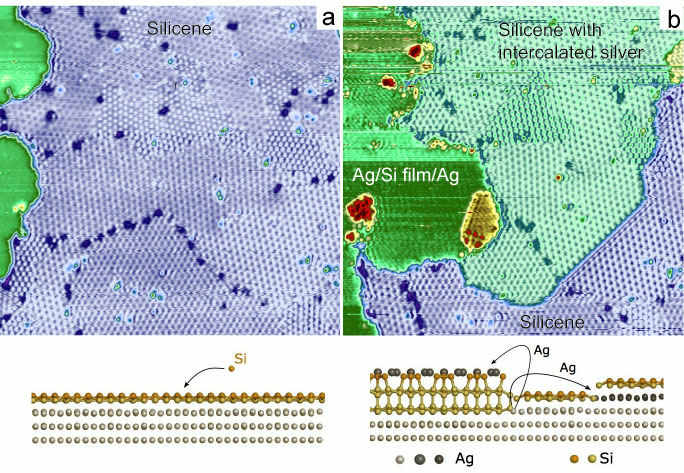 The results also indicates that the Ag substrate is relaxed upon Si adsorption, which indicates a non-negligible coupling between silicene and silver. Similar observations are obtained for the other reconstructions observed (2V3x2V3R30°) and (V13xV13R13.9°). Figure 4 : Top (a) and lateral (c) view of the relaxed (4x4) structure on Ag(111) computed from DFT. The two Ag bottom layers have been omitted. alpha and beta are the angles indicated by dotted blue lines. The lateral view is a cut along the pink dotted line drawn in (a). b) Simulated STM image for a bias voltage U=2 V.
3. Silicene thin films : are they silicene ? 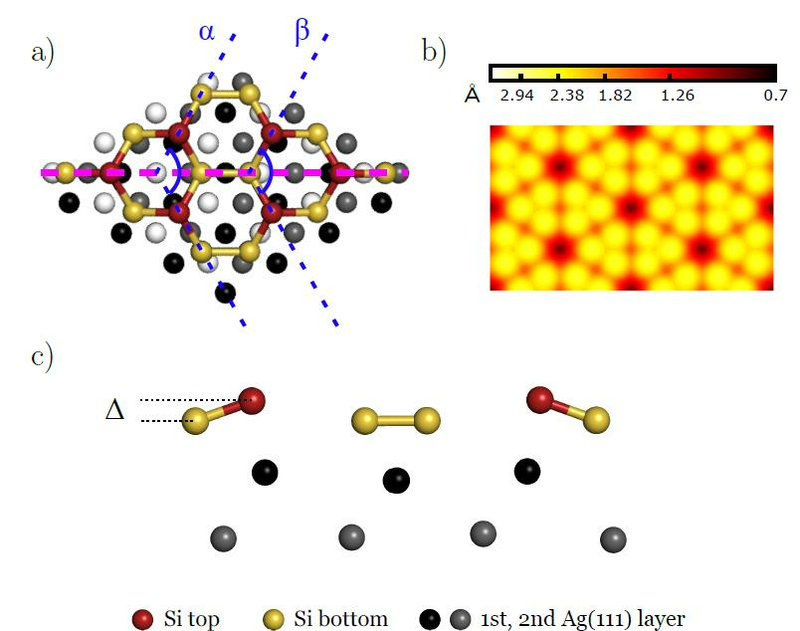 The strong interaction between silicene and Ag modify the interesting electronic properties expected for free standing silicene. That is the reason why researchers, have tried to synthesize silicene multilayers by continuous Si evaporation on Ag substrates, in analogy with graphene multilayers. When the substrate temperature is below 540 K, a quasi layer by layer growth mode is observed, together with linear dispersion bands in the electronic structure, that cross the Fermi level near the K point. This could be the signature of Dirac cones. Figure 5 : a) Map of the intensity diffracted by 8 ML Si evaporated on Ag(111) at T = 520K, as a function of momentum transfer parallel or perpendicular to the surface (in reduced units). The spots and rod at q//=1 correspond to the Ag substrate. The other spots correspond to the silicon diamondlike film with various orientations such as the one shown in b) and c) for 4 ML Si. Using GIXD, we have studied the structure of 8ML Si films grown at 500 K on Ag(111). Our results unambiguously demonstrate that these films have silicon bulk structure with a (111) surface and different in-plane orientations. Moreover, we were able to measure the X-ray intensities associated with the (V3xV3) reconstruction of the silicon film. Results are well fitted with the honeycomb-chained-triangle model of Ag/Si(111). This shows that Ag atoms wet the surface of the Si films. From this study we could conclude that the linear dispersion bands cannot be attributed to silicene multilayers. Figure 6 : sequence of STM images of the Ag(111) surface upon Si deposition at T = 500 K.
Figure 6 shows a sequence of STM images of a Ag(111) surface acquired continuously during silicon evaporation at a substrate temperature T=500 K. As soon as evaporation starts, the Ag steps, initially curved, become straight. Darker domains with triangular shapes form on the terraces, and new terraces develop. This can be interpreted as the formation of silicene domains inside the Ag terraces, growing by expelling Ag atoms that recondense at the step edges. This is in good agreement with DFT calculations showing that the insersion of a Si atom in the Ag surface is energetically favored, by 0.8 eV. Beyond one monolayer coverage, we could also observe the transition between a silicene layer and the silicon film. This is illustrated on figure 7. The silicene layer (in blue) is progressively replaced by a thicker film covered with Ag (in green). Surprisingly, the silicon film forms by insertion of Si atoms that dislodge the atoms of the outermost Ag layer. Part of the released Ag atoms wet the Si film, while the remainder intercalate below the silicene layer. Figure 7 : comparison between two STM images of the exact same sample area for increasing Si coverage, and model for the growth of Si films. Beyond evidencing these unexpected growth mechanisms, we understand now why it is possible to grow silicene on Ag(111), although silicon is the most stable structure for Si atoms. 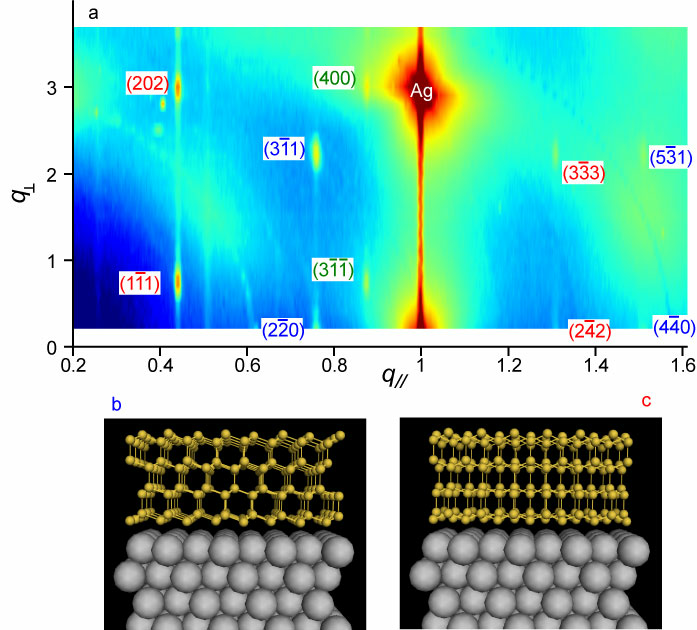 The energy barrier associated with the exchange of Si and Ag atoms below the silicene layer is responsible for the high stability of the silicene layer on Ag(111).